Japan has released the Prelim Machine Tool Orders y/y data and the US will publish Final Wholesale Inventories m/m, Core PPI m/m, PPI m/m and NFIB Small Business Index. 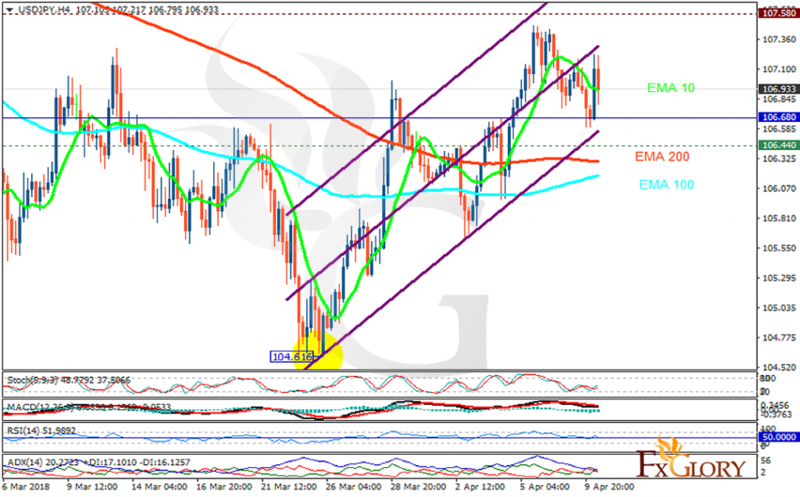 The support rests at 106.440 with resistance at 107.580 which the weekly pivot point at 106.680 is located in between the lines. The EMA of 10 is moving with bearish bias in the ascendant channel and it is above the EMA of 200 and the EMA of 100. The RSI is moving on the 50 level, the Stochastic is showing upward momentum and the MACD line is below the signal line in the negative territory. The ADX is not showing any clear signals. The support area is too strong to be broken therefore buyers can target 107.6.